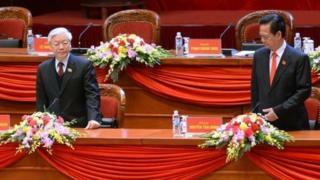 The General Secretary of Vietnam's Communist Party, Nguyen Phu Trong, will be the only candidate for the post at a party congress, state media report. It means his main rival - reformist PM Nguyen Tan Dung - has little chance of taking the leadership role, they say. But complicated voting procedures mean another candidate could still be named before the congress ends on Wednesday. Conservatives, led by Mr Trong, are concerned that Vietnam is abandoning its socialist past under Mr Dung. During his 10 years in office Mr Dung has driven the reforms which have seen Vietnam grow quickly as it has been integrated into the global trading economy, reports the BBC's Jonathan Head from the Vietnamese capital Hanoi. However, he adds, the speed of the reforms and rising corruption have been criticised by the conservative camp. The Communist Party congress - which is held every five year in the one-party state - is meeting in Hanoi. Behind closed doors, the 1,510 members will nominate the party's general secretary and the next president and prime minister. Mr Dung is seen as modern, and friendly towards the US. He has also gained popularity domestically with strong anti-China rhetoric when it comes to disputed territory in the South China Sea. Mr Trong is seen to be more friendly towards China - Vietnam's largest trading partner.